CBS News will honor the legendary anchorman Walter Cronkite who passed away on July 17, 2009, at the age of 92 with the primetime special "That's The Way it Was: Remembering Walter Cronkite," airing Sunday, July 19 at 7 p.m. ET/PT on the CBS Television Network. 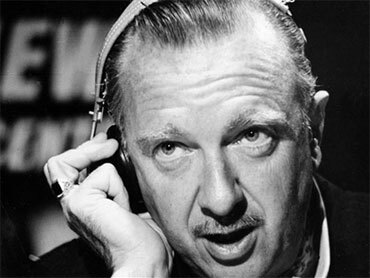 Considered by so many in this country to be the "most trusted man in America," Cronkite was the biggest name in television news through whom generations of Americans witnessed history. This sentiment is echoed by some of the biggest names in politics, news and entertainment - including President Barack Obama, CBS News colleagues Mike Wallace, Morley Safer and Don Hewitt, Katie Couric, George Clooney, Robin Williams and Spike Lee - who each share their own memories of the industry's elder statesman as part of "That's The Way It Was." "Walter Cronkite represents the best of CBS News and the journalism profession as a whole," says Sean McManus, president CBS News and Sports. "With a rare combination of confidence and familiarity, Walter left a personal mark on the most powerful stories of the 20th century - from the assassination of President John F. Kennedy, to space launches and the Vietnam War. His presence on screen was incomparable." President Barack Obama: "He brought us all those stories large and small which would come to define the 20th century. That's why we love Walter, because in an era before blogs and e-mail, cell phones and cable, he was the news. Walter invited us to believe in him, and he never let us down." "America had a love affair with Walter Cronkite." "There is something that is so quintessentially American about Walter Cronkite ... his honesty and candor in difficult times…if someone has integrity, to me, that is the finest attribute they can have. That means honor at a time when so many people are dishonorable. I think Walter Cronkite was and will always be the personification of those qualities." "He was a freedom fighter and he was an honest, truthful guy that used his power while he was here on earth well, he was for the good… It just so happens that everybody's trust was put in the right place. That's the lucky part of all this." "The passing of the years did not diminish as nearly as I could tell, one iota, his interest in, and love for his country and his desire to see the world get better." "His legacy will be one of the great legacies of great Americans. It sounds overstated, but it isn't. He's that important to us. Not just to generations before him but to generations coming up… That's probably good that there will never be a most trusted man in America again because if we're not lucky enough to get Walter Cronkite, then we might be in a lot of trouble." "Walter got early on that this job is part hand holding, so that all of us in this line of work - who on days like 9/11 have been forced into any kind of explanatory role - Walter is with you whether you see him in the studio or not!" Andy Rooney, correspondent, "60 Minutes": "He was the best newsman, he was just dedicated to news, he really cared about what the news was and he thought it was important to tell it to the American people, it's that simple." Charlie Gibson, anchor, ABC "World News": "Walter's early lessons would be well kept in mind by all of us who have followed him. And that is to keep it on the news. Tell people what happened that day, keep it short, keep it direct, and keep it accurate." Robin Williams, actor/comedian: "[Walter] was a man of integrity at a time when we needed it. At a time when we still need it. A man, a legacy of someone who believes in the first amendment as being one of the prime directives of democracy, but also of civilization. The idea of speaking out, and speaking directly." Diane Sawyer, co-anchor, ABC's "Good Morning America" and "Primetime Live": "You miss these people who stand above the horizon a little bit and remind you where to look. You miss people who seem to stand not just for something, but stand for us." Morley Safer, correspondent, "60 Minutes": "What I miss about Walter is that 2:30, 3:30 in the morning, 'Let's have another drink. Let's find another friendly saloon.' Not the more do-er first amendment man, it was that wonderful, fun loving, life loving kid really." "That's The Way it Was: Remembering Walter Cronkite" airs Sunday, July 19, at 7 p.m. ET/PT on CBS.